Last night, I tried something a little different -- wrenching on bikes. No, really, hear me out! I know what you're thinking: How is THAT any different than any other day? Well, this was wrenching for 2nd Cycle in Tacoma, and they've got an interesting business going. Seems what they do is take a combination of bike donations, dumspter-dives, and garage sale finds, fix them to road-worthy condition, and sell them to the local "need a bike for transport" population at very reasonable prices. They're well-equipped for tools, better than most bike shops I've been in, and they're not a service shop. Condition of the incoming bike doesn't really matter -- there's always something that can be salvaged from it. Broken frames are stripped of usable parts, then sold for scrap metal. The parts are then gathered to use on other bikes in need of parts. There is a smattering of new pieces both for sale and use on the bikes, mostly consumable-types like tubes and chains. Selling prices reflect the area and clientele, as well as the bikes themselves. After I finished working on one of the "nicer" of the bikes, I heard the shop owner and another of the volunteers talking over the selling price -- $90-100. 2nd Cycle has been in business for about 4 years, and in their current location on Tacoma's Hilltop neighborhood for a little over a year. Apparently they're doing well enough to stay around a while. Unfortunately, my cell phone battery gave up just as I pulled it out to take a couple pictures. I'll have to make another post with some pictures when I get back there. I'll admit that I really don't know the deep ins-and-outs of their business, and I was only there for about two hours of their first-for-this-year volunteer night. They're planning on having a volunteer orientation on one of the volunteer nights coming up soon, and to make the volunteer nights a regular happening. What could be better on a Sunday morning – a ride on an island with 4000 of my best-friends-I-just-met, biting wind, hills, and food for sale? 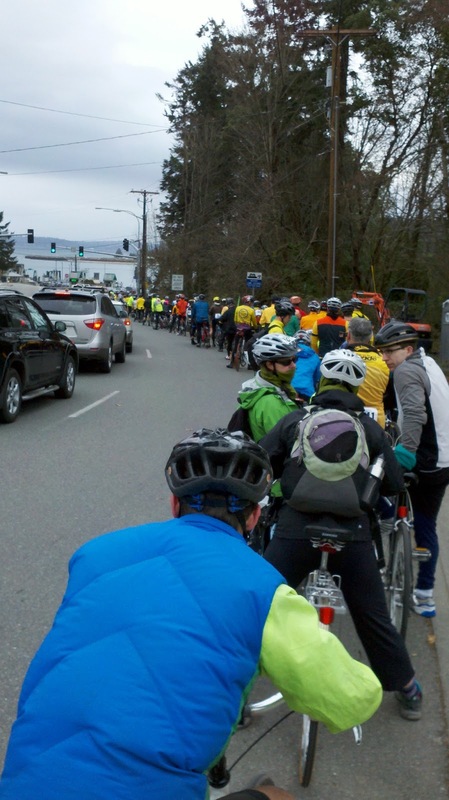 This is the spectacle that is Chilly Hilly, the semi-official kick-off of the Seattle biking season for recreational riders. And after something like a 20 year hiatus, I decided to join the madness (at the cajoling of Eric – paybacks are hell, yes?). I left my house at 7:10am, riding the 2.5 miles to Eric’s house for a carpool north to the Seattle ferry terminal. Pat (shoeless on BeginnerTriathlete) joined us as well. 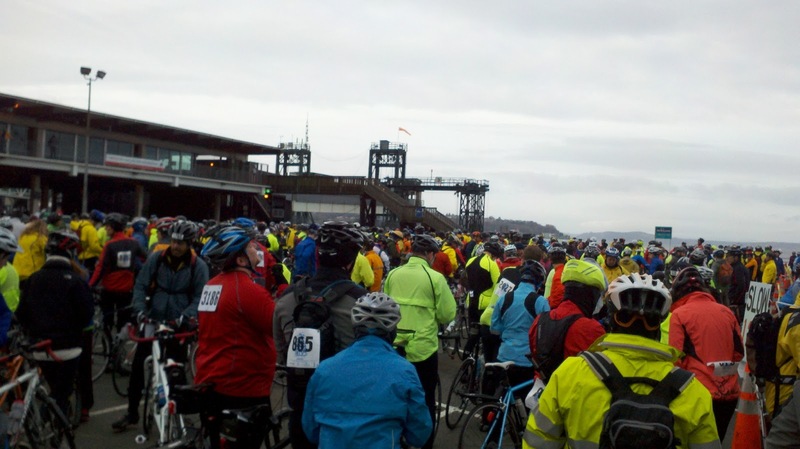 We quickly got our gear together, making the (very) short ride into the queue for the boats, and where the Puget Sound stopped, a sea of cyclists started. Let the Chilly begin – waiting for the ferry turned out to be the worst part of the day… I’ll get back to you on that. We were assured that we’d all get on the ferry, so figured there was no worry. And we did manage to all get on that boat. Amazing. A merciful 15 minute wait this time. 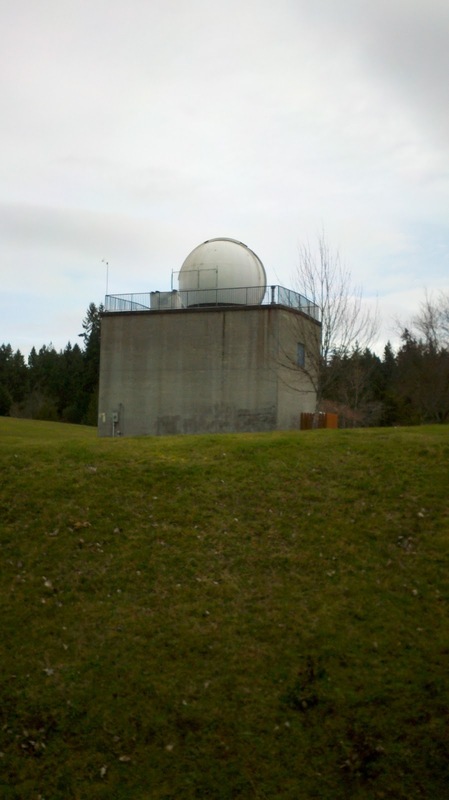 Once on the other side, Bainbridge Island, the hills started immediately. Nothing huge or steep, either up or down, which is a good thing considering (a) the number of people that were dumped onto the local roads all at once, and (b) the disparate skills involved in that crowd. All thoughts of cruising at even a normal ride pace were quickly abandoned, instead replaced by a self-preserving vigilance of those around me. Yes, it did eventually thin out. For a while. Parts of the ride are already a blur. Maybe it would have been better to make more picture stops. Photos of some of the real character of the island (and the riding characters). There was the guy who had a very large frog on a Trail-a-Bike, several single speeds (ouch), a few fixies (OUCH! ), folding bikes, mountain bikes, and even one unicycle. We bypassed the first couple seemingly-unofficial rest stops, and then stopped at the main rest stop at 18 miles. I was shocked to see that all the food there was for sale! Fortunately Clif Bar was there giving out samples of Clif Bars and Shot Blocks. I understand that these things can be money makers for groups, but $5 hot dogs? The water (the stuff from the hose, not bottles) was free at least. At the base of one of the largest hills, there was a group giving free shots of whiskey. No, I didn’t stop for a drink. I should have at least stopped to take a picture of that. Maybe THAT’S why those people we weaving so violently going up that hill. But there were some nice sights along the way. And a very welcome final hill into “town” near the ferry dock. 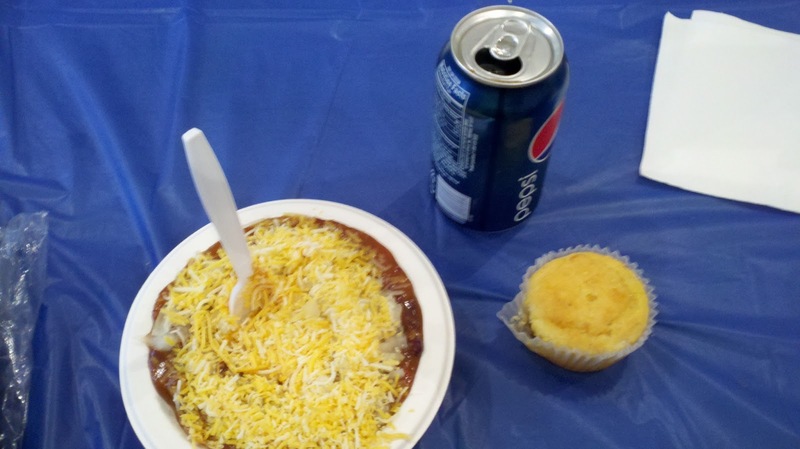 We stopped in the finish area, decided that, yes, we’d go ahead and partake of the chili feed (for $8), get warm, then head down to the ferry dock in time to load up for the 1:10 ferry. We figured the less time between getting there and leaving, the less cold we’d get. Well, that kind of backfired, as we were queued up still when that 1:10 ferry weighed anchor and set sail for Seattle. D’OH! At least there was a walk-on passenger area to hide out from the wind for a while. 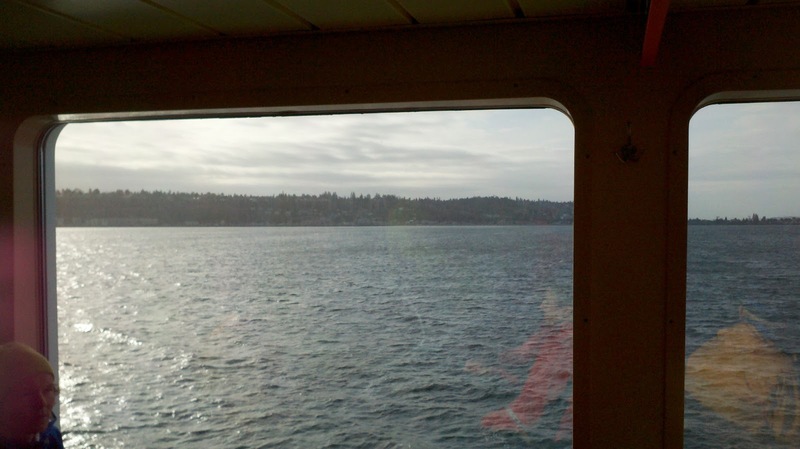 Another half-hour boat ride, and we were back in Seattle. A short coast to the parking lot, load up, then the drive back south to home. By the time we were back in Puyallup, I was warm again. Finally. Just in time to get back on the bike and ride another couple miles home. On Monday, my supervisor (who is a casual rider) asked how the ride was. My answer: Chilly and hilly. How appropriate. The Beattles were prophetic, it seems. It's like the US Postal Service raising the price of stamps because people aren't sending as many letters any more. In spite of Washington State existing at the top tier of gasoline taxes, transportation revenues aren't high enough. So there's a plan in the Washington House of Representatives to impose a $25 tax on all bicycle sales over $500. Um, in Pierce County, there's an annual phenomenon every September where massive numbers of new road construction projects (usually in the form of chip-sealing perfectly smooth roads) are undertaken. Why? To drain the budgets. If you don't USE it this year, you won't GET IT next year. Seriously. I've talked to the people inside the process. It's sad. And this is the process that apparently needs more money. But who knows, maybe this will turn out to be a good thing [AHEM]. Maybe all the money generated will go towards improving the existing roads to construct bike lanes. Or at the least, a 3-4 foot maintained shoulder. And maybe, since we're now all paying taxes that go directly to roads, we'll get respect from motorists. I can't tell you the number of times I've been told by motorists that I don't belong on the roads because I don't pay for them. [Ignoring the fact that, yes, I do have a car, and my PROPERTY taxes go to these same funds as well.] Heck, if $25 would get that kind of respect on the road, I'd pay it several times over. One can dream, I guess. But I do worry about the affect on the bicycle industry. Especially at the local-bike-shop level. People that walk through the doors are already trying to price compare on Wal-Mart pieces of crap. Is the new glass ceiling for bikes now going to be $500? Will all sales over that amount shrivel up and blow away? My mind is already reeling with the possibilities to circumvent this ill-conceived plan. * Does this apply to bicycles bought out-of-state, like online sales? Again, this will be a hit to the local bike shop. And since there's no registry required on bicycles in this state, how will they (Big Brother Government) know? * Will this apply to incomplete bicycles? If I sell a $490 frame, fork, headset, etc. (everything except the wheels), and a $200 set of wheels (as separate sales) and show the customer how to complete the assembly, does this count? * And also since there is no registry in Washington, how about private-party sales? I think a better solution would be to tax the heck out of studded tires. I don't have to GO there to know that there won't be any bikes parked in the House of Representatives parking lot... But I'll probably trip over the ash trays. Signing up for events... In the past, it's caused me to get injured. At least signing up for RUNNING events. Okay, "caused" is not scientifically correct, as correlation does not equal causation. But it's also hard to argue with the number of times I've gotten injured within days of signing up for an event. In more than one case, it's happened the day after I signed up. Cycling events, though, have been a little different. So I'm less nervous about losing the opportunity for participating after paying for the privilege. Maybe it's the nature of the events themselves... Running races (and even more so, triathlons) for me are more competitive. I'm gunning for place, age group and even overall. For cycling events, I've left behind the days of vying for overall placing, so USAC-style team racing is in my past, there to remain forevermore. Been there, done that, took a lot of pain and transformation to get there, not interested in going through that again. No, the cycling events I'm doing now are more mass-participation, challenge rides. Some track finish times, some don't. 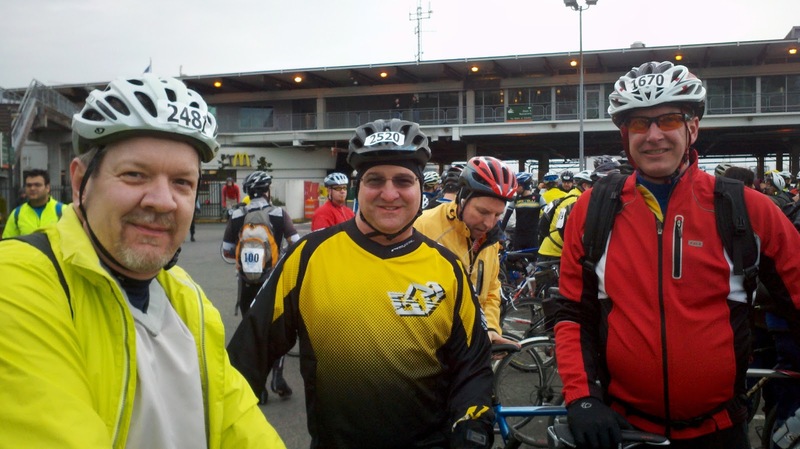 And so this past week I've signed up for two cycling events. The first is Chilly Hilly, which happens this coming Sunday. As the name suggests, the course is quite hilly. Not in the mountainous sense that RAMROD is hilly, but short sprinter-type hills that challenge leg strength and gear selection. 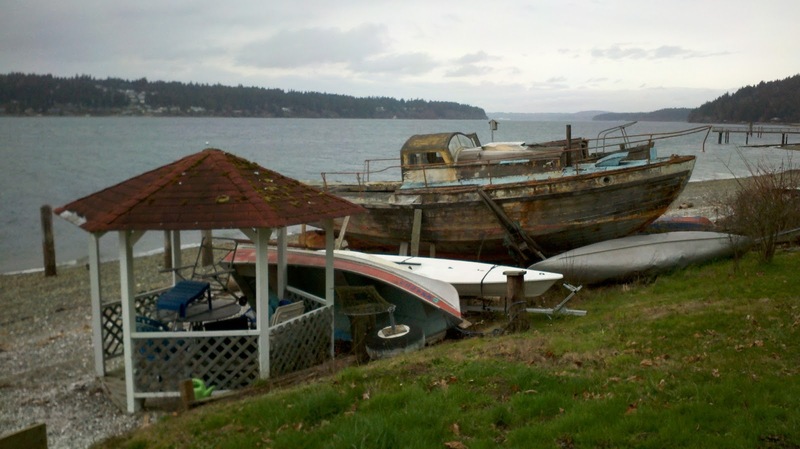 A 36 or so mile circumnavigation of Bainbridge Island. I've done this course several times over the years, and done it as this event one other time some 20 years ago. The very nature of dumping several waves of a thousand cyclists a pop of varying ability (or lack thereof) onto fairly narrow and undulating country roads negates any ambitions of speed for at least several miles. Add to this that the ride is considered by many the first time the bike has been dusted off since September of the previous year, and you can imagine what the road looks like -- weaving all over, paying little attention to anything that's not directly ahead... It can be a bike-handling challenge. In the one year I did this event, I had one rider stall out on a hill directly in front of me. Did the whole Laugh-In stop and fall over. I had to dodge left swiftly to avoid hitting him. It should be loads of fun. The second, which is both bigger and smaller, is the Gran Fondo Leavenworth. Yep, one of the events I mentioned in a previous post as falling on a not-so-convenient date (being the day after my wife's birthday). Well, she actually gave this event the nod, as it's not actually ON her birthday, and can be made into a nice weekend get-away in a town she's never visited before. Leavenworth is a Bavarian-style tourist town nestled into the eastern Cascades. And when I say "Bavarian-style", I mean it's REALLY Bavarian-style, right down to the shop proprietors wearing Lederhosen and knee socks. The bigger aspect? This event is 87 miles of mixed paved roads and Forest Service roads, including three passes. Could be the equivalent of 120 or more road miles by the time it's all said and done, as far as the physical toll. The smaller aspect? It's limited to 200 riders. This will be a new kind of adventure for me. I've done road events, mountain bike races, cyclocross races (on my mountain bike), tours... Never a mixed-surface event of this magnitude. And it's a timed event. There will be packs, which I'm sure will be "up the road" from where I'm riding... Fine by me.